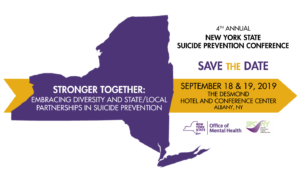 Sponsored by SPCNY and the New York State Office of Mental Health, the New York State Suicide Prevention Conference features leaders in suicide prevention research, treatment, service delivery, advocacy, and from the lived experience community. Held annually in September, the conference provides networking and learning opportunities for clinicians, administrators, coalitions, survivors, educators, advocates, and anyone interested in suicide prevention, intervention, and postvention. The conference theme this year is STRONGER TOGETHER: Embracing Diversity and State/Local Partnerships in Suicide Prevention. Mark your calendar and join us on September 18th and 19th at the Desmond Hotel and Conference Center in Albany. For additional information, visit the conference website. We are currently accepting proposals for oral and poster presentations. The submission deadline is May 3. Please see the Call for Proposals for more information and to submit your work!